Aurélien-François-Marie Lugné-Poe was an actor and a theatrical producer. He studied at the Conservastoire and worked as an actor at the Théâtre-Libre (a private naturalist theatre managed by André Antoine) and the Théâtre d'Art. 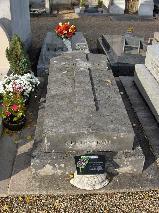 From 1892 until 1929 he was the manager of the Théâtre de l'Oeuvre in Paris. There he staged Oscar Wilde's "Salomé" (February 2th, 1896) and Alfred Jarry's "Ubu Roi" (December 10th, 1896). He introduced the works of Ibsen and Strindberg to France. In 1912 he staged "L'Annonce faite à Marie" by Paul Claudel. He also promoted Maurice Maeterlinck and Gerhart Hauptmann. 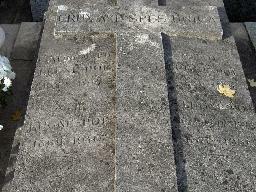 The grave of Aurélien-François-Marie Lugné-Poe at the Vieux Cimetière, Saint-Germain-en-Laye.